BOOM! These adventurers are packing all the black powder you'll ever need. 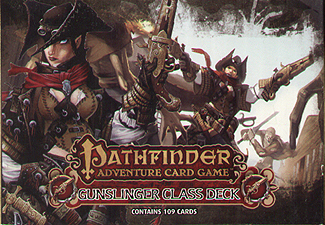 The Pathfinder Adventure Game Gunslinger Deck features three new characters, all wise in the ways of firearms, This 109-card accessory for the Pathfinder Adventure Card Game gives your gunners enough weapons, bullets, and other boons to blow up anything. Take your gunslinger from novice to hero in any Pathfinder Adventure Card Game Base Set or Pathfinder Society Adventure Card Guild organized play campaign.